With console, wall and sofa tables galore we’ve got rustic furniture for living rooms and more! Have you ever walked into a well-decorated room full of beautiful lodge décor or cabin furniture and still thought, “Is it just me or is something missing?” That something very well could be a rustic console table, wall table or sofa table. Few people understand how big an impact one piece of furniture can have by balancing out a slightly askew rustic decorating scene. At Woodland Creek's, we give you dozens of distinct wood furniture and log sofa table options to choose from! 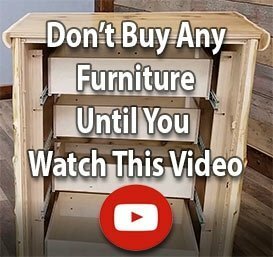 Maybe you’re looking for rustic sofa tables with built in shelving. Maybe not. Could it be you’re craving a western furniture console table with distinctive classic pioneer styling? Have it your way! Whether you gravitate toward aspen furniture with antler accents or reclaimed wood furniture with a subtler rustic décor feel, you’ll find just the table you’re looking for at Woodland Creek's Log Furniture Place. Whatever your taste is, finish off that primitive furniture or rustic log furniture look with a barnwood wall table or rustic entry table that’s built to last. Our expert craftsmen know what matters to you. Solid hardwood construction, decades of expertise and thoughtful details which accent everything from cabin to western décor are built right into every console table (and key hop!) we carefully construct.